It’s hard not to notice the “Star of Texas Rocker” and that’s exactly what its creator, Larry Dennis, had in mind. Jerry Dennis and the Star of Texas Rocker. 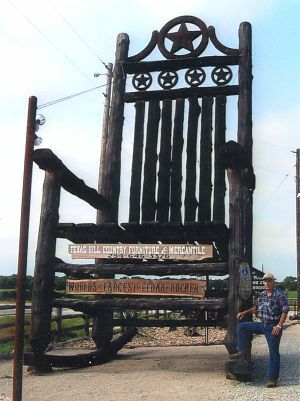 The cedar rocking chair, standing more than 25 feet tall and weighing more than 5,600 pounds, graces the parking lot of Texas Hill Country Furniture and Mercantile at 19280 Hwy. 281 S. in Lipan, Texas. The store, owned by Dennis and his wife, Sherry, features numerous examples of more traditional furniture. There’s also a vast selection of everything from wooden staircases and mantles to windows and doors -- all constructed at the on-site sawmill. But, as the names implies, the “star” of the show is the mammoth rocking chair. “I built that in 2003,” Dennis said. “I just wanted to see if I could build a big one. I wanted to catch people’s attention.” And that he has. U-turns are not unusual on this particular stretch of 281, as motorists head back to make sure they aren’t imagining things. Others arrive at the store having already seen the rocker in various publications or on television. According to Dennis, film crews from MTV shot footage of of the chair that aired in 2005. “And Jay Leno made fun of it on the Tonight Show,” he said. A plaque posted to the rocker states that officials from Guinness declared it the “world’s largest” in September of 2003. The rocker was built in just five and a half days. “There were three of us working on in for three days,” he said, “and five of us for one day, and six on the last day. We started with the trees and took it all the way to the finished product.” It took approximately 28 trees to make the Star of Texas rocker. Originally from west Texas, Dennis spent many years in Weatherford, Texas, doing woodwork of a more conventional nature -- including work in several area church buildings. “I’ve been working with wood since I was 18,” he said. “That’s a long time.” The young-looking Dennis won’t say exactly how long that’s been, but he revealed an analogy that he shares with his grandchildren. “I like to tell them that when God was planting the trees, I was helping water them,” he laughed. Other businesses (operated by Dennis family members and friends) share the property with the mercantile, including a restaurant. Some of the material for the buildings was recycled from area landmarks. In addition to cedar furniture, the mercantile also features home furnishings and accessories, as well as hand-crafted leather items, gift items and Texas collectables. Almost all are produced by area craftsmen and artisans. The little man and the big rocker -- a great combination.